PAK1 antibody recognizes the serine/threonine-protein kinase PAK 1, also known as alpha-PAK, p21/Cdc42/Rac1-activated kinase 1 , or p65-PAK. Mouse anti Human PAK1 antibody recognizes the serine/threonine-protein kinase PAK1, also known as alpha-PAK, p21/Cdc42/Rac1-activated kinase 1 and p65-PAK. PAK1 encodes a family member of serine/threonine p21-activating kinases, known as PAK proteins. These proteins are critical effectors that link RhoGTPases to cytoskeleton reorganization and nuclear signaling, and they serve as targets for the small GTP binding proteins Cdc42 and Rac. This specific family member regulates cell motility and morphology. Alternatively spliced transcript variants encoding different isoforms have been found for PAK1 (provided by RefSeq, Apr 2010). 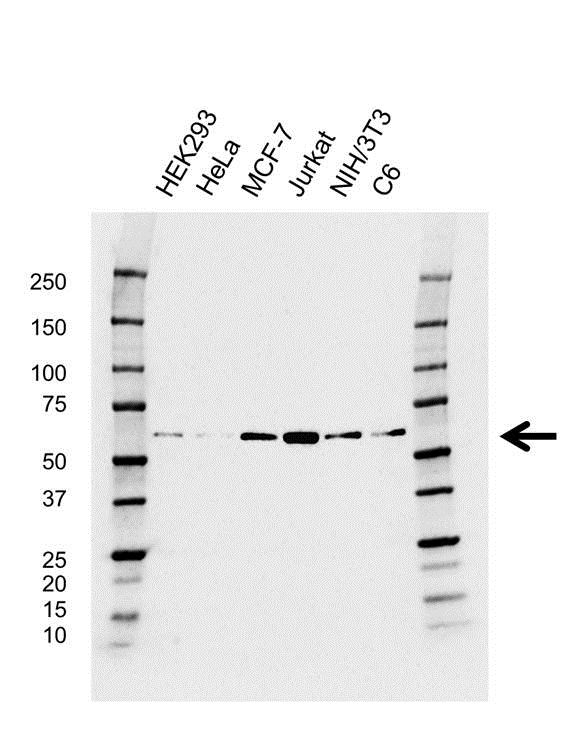 Mouse anti Human PAK1 antibody detects a band of 60 kDa. The antibody has been extensively validated for western blotting using whole cell lysates.